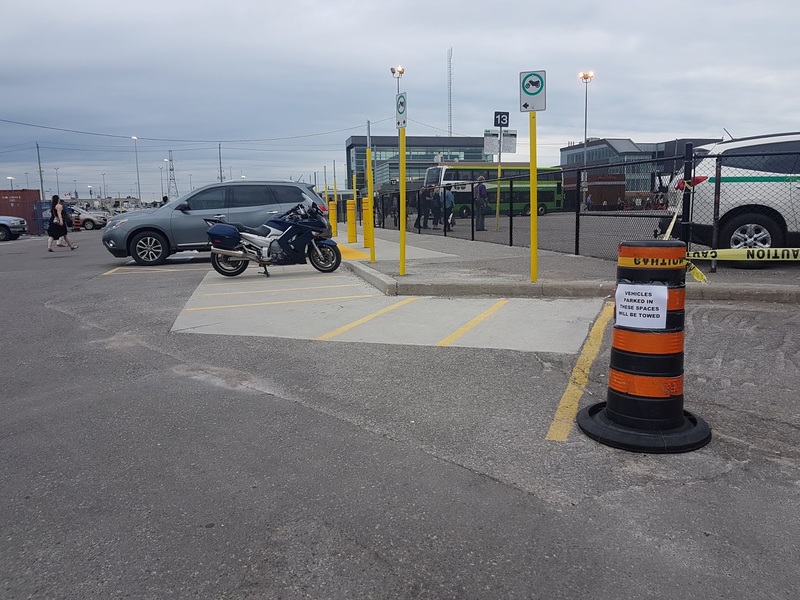 Heads up motocycle friends who had emailed me (and customer relations per my suggestion) in the past annoyed that vehicle drivers were using designated motorcycle parking spots at Oshawa GO - GO Transit has listened. The sign reads, "Vehicles parked in these spaces will be towed". I know the sign looks highly suspect but checking in with a GO Transit Safety Officer on-site, I confirmed it's legit. I only asked because a reader named Doug wrote me threatening to take matters into his own hands by "borrowing a traffic cone from Bloor Street construction to make a point". I'm telling you, some passengers don't mess around. Yeah, we'll see. There are non-spots with tow-away signs in the far-east lot and people park there very single day without consequence. Now if they'd also enforce all the people parked in the handicapped marked spaces waiting to pick up passengers - that'd be something!! !